Hello everyone! Today I want to talk with you about the evolution of women`s shoes. I think it is quite interesting and important to know, what have changed and what ideas have developed during these years. Hope you will like this information! Really big and heavy boots were extremely popular during the war. Later a new type of shoes developed,that were much more suitable to factory work than the shoes worn previous to the war. Even shoes were wide toed, sturdy and comfortable. When when the war was over, skirt lengths shortened and there was a sudden interest in what was on the feet. Decoration was added to all shoes. Women tried to make it as beautiful as possible, adding feathers, rosettes, fur, velvet ribbons, lace. By the end of the decade, buckles were only a functional detail. 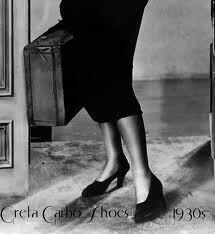 In the twenties, the pointed toe became popular. Straps were added, and shoes became lighter and finer. Bar shoes became very popular with women, and were the most popular style of the decade. The most important thing is that they stayed on the foot while dancing. The heel during the whole period remained the same - about two inches. The "Cuban heel" was still the most popular. In 1925, a more slender version, and in 1931, became known as the Spanish heel. By the end of the decade, shoes were lighter, the shaping was more delicate, and there were infinite varieties of colours and fabrics. The new tailored suit, which was fashionable for women’s daywear, required new, more business like shoes. Heels became lower, broader, and more angular. Suede was accepted for use on sensible walking shoes. But at the same time sneakers with rubber soles and linen uppers came into fashion, and were found to be comfortable and sturdy. The idea of a long-lasting shoe had to also be applied to eveningwear, however, and suede and kid replaced the silks and satins that had been popular early in the decade. Black was the most popular colour for day shoes, but wine, maroon, and navy gradually established a foothold by the end of the decade. Ankle high boots were a necessity for winter. These were usually made of suede, and were front laced. The cork-soled, covered platform, and the wedge were high in fashion. However, during wartime the platform and the wedge were stripped of their covering, leaving the cork exposed. For walking, low chunky heels and wedges with laced and buckled uppers were quite popular. After the war and rationing ended, light revealing shoes appeared very swiftly. These gave very little support to the foot. 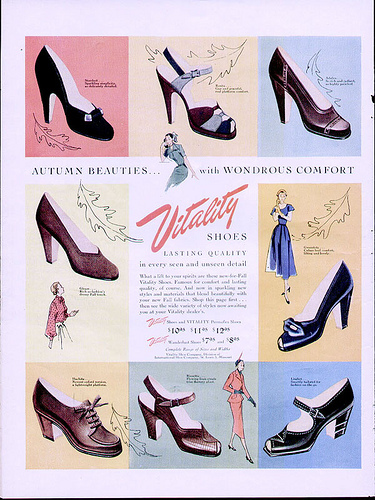 In 1947-8, the shoes had a rounded shape; the toes being less chiselled. Wedge soles were still popular, but much thinner than during the war. Strapped shoes appeared, and all kinds of sandals and peep-toes reached a height of popularity after the long years of sensible footwear ended. Velvet, kid, coloured leathers, bright satins, and bronze (a burnished leather) were all popular. Christian Dior began the Fifties’ New Look, bringing the fashion world back to Paris, but the Italians were a formidable force in shoe fashion. In Italy’s post-war boom, the shoe factories made many technical and design changes. 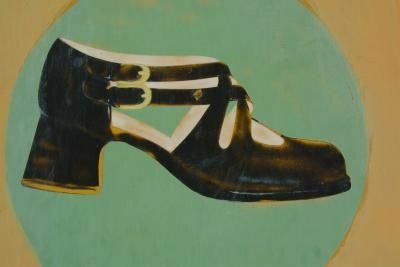 The light, elegant sandal was the most distinctive creation of the Italians, and the race to slim down the heel began. Women’s shoes of the 1950’s were arched, sophisticated and cut away to reveal the maximum of the foot. These were perched atop narrow delicate heels that only diminished in width as the decade wore on. In 1950, heels for women were all fairly high. By 1954, however, there were a variety of heights for different occasions and times of day. The stiletto heel arrived in 1955, with a heel so narrow it appeared pointed. This heel was added to court shoes and pumps, punching holes in sidewalks and hotel lobby floors all over New York until the fashion died out. It was still worn in 1960, but in a much lower and less dangerous form. In the late 1950’s, lower squat heels began to rival the stiletto, which had reached staggering heights. Flatties with no heel and a flimsy sole were also popular, but mostly for indoors or for wear with trousers. 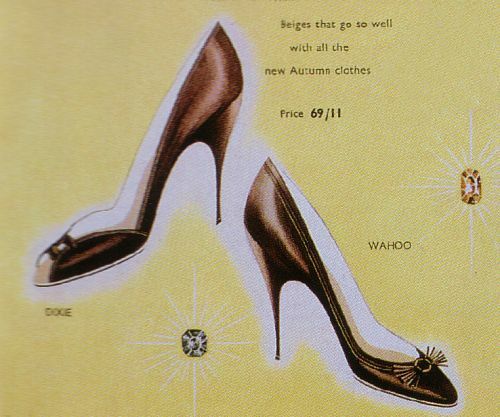 The spool heel, so called because of its resemblance to a thread spool, was very popular in 1952, and although its large diameter went out of fashion quickly, the circular heel shape remained. 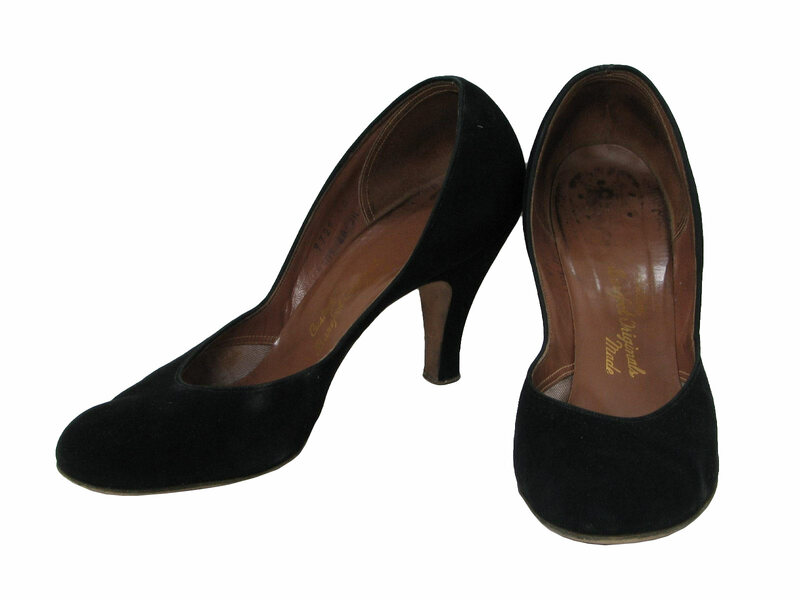 In 1955, Givinchy introduced a new shaped court shoe cut straight across the instep, and called it the opera pump. This pump had a lower heel and a wider toe. Sandals and mules were still important in the 1950’s. In 1951 the mules and sling back sandals showed the heel of the foot. At the beginning of the decade, colour and fabric were of little importance to shoe fashion. Shape was everything. The fabric was usually a smooth leather or soft suede in black or brown. For evening, colours were brighter and the uppers were usually of satin. In 1954, a craze for all things Oriental hit the west, and Turkish slippers in deep hues appeared. These were often embroidered and decorated with gold beads. Though the craze quickly died, the colours and fabrics of the 1955 lines show how influential the mood had been. For schoolgirls, the Mary Jane was a very popular style. The shoe had a low heel, and usually had an ankle strap. Hope you liked this information! Have a nice day! And don`t forget to leave comments!